A sweet and creamy side dish that is perfect for any meal. 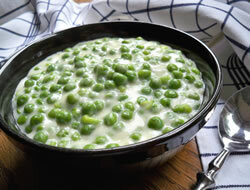 This creamy sauce adds a nice sweet touch to the great taste of fresh peas. In a medium saucepan over medium high heat, combine peas, salt and water. Bring mixture to a boil. Reduce heat and stir in butter. 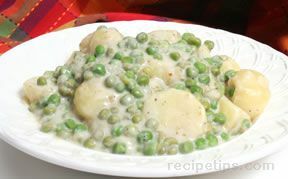 Stir cream mixture into peas. Cook until mixture has thickened and bubbles, about 5 minutes. Note:The cream sauce will thicken further once it is removed from the heat and begins to cool. 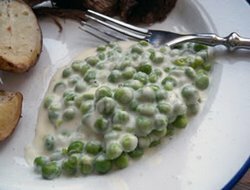 "Great creamed peas! I used half & half instead of heavy whipping cream for the white sauce and it was still plenty rich. 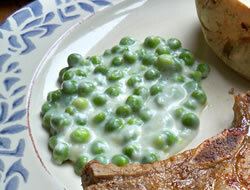 The kids even liked these creamed peas once I convinced them to at least try them."